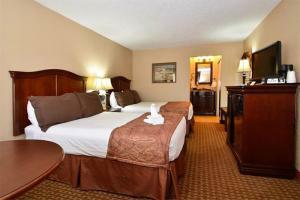 Best Western Plus Landing View Inn & Suites offers a relaxing retreat in the heart of historic downtown Branson. 108 well-appointed guests rooms are equipped with a flat-screen TV, microwave, mini-fridge and high-speed WiFi. The hotel features an indoor pool, a fitness center and FREE parking. Enjoy friendly service and a complimentary full hot breakfast buffet. This hotel is located 8 miles from Branson Airport.